1st International DHC+ Summer School ‘DHC and the Smart City’ took place from 25-30 August 2013 in Berlin. 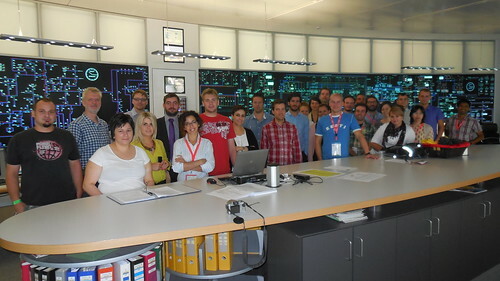 24 students and young professionals from all across Europe and beyond had registered and were eager to learn about the role of district energy in a smart city. During four days of lectures the participants were taught about district heating and cooling basics, smart production, smart networks and a smart approach to consumer issues. The 9 lecturers – all academic experts or experienced practitioners from universities, research institutes, utilities and industry – had prepared diversified sessions mixing theoretical approaches with practical experiences. A special thanks must be directed to Vattenfall for providing the summer school with a great venue and providing the participants the chance to visit numerous facilities including the CHP Mitte in the heart of Berlin and Vattenfall’s main control room. Also, the organisers would like to thank Danfoss for providing the participant with transport tickets and Logstor for providing USB sticks for the learning materials. At the last day of the Summer School the participants were asked to prepare a research project aiming at a smart DHC city and to present it to their co-students as well as to the present experts, i.e. Yves Delaby, Chair of the DHC+ Technology Platform. All presented projects were as ambitious as they were innovative and showed the high level of knowledge and expertise the students had brought with them and had absorbed during the week. In the end all – organizers, lecturers and participants – were very happy with the outcome of this first edition of the DHC+ Summer School.